Spectacular set of Rare Ruby and Diamond Pendant Earrings suspending a cushion-shaped Ruby weighing 7.01 carats. 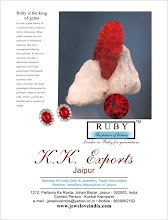 It is surmounted by an oval Ruby weighing 2.04 and 2.05 carats respectively. The Rubies are surrounded by brilliant-cut Diamonds altogether weighing approximately 8.90 carats. The complete set up is mounted in 18 karat White and Yellow Gold. This rare set of beauty was auctioned for a whooping $2.5 million. What do you think about this set of red fire? Share your comments and reactions below.